Public policy is a broad and interdisciplinary area of study and research in the field tends to reflect this. Yet for those teaching and studying public policy, the disjointed nature of the field can be confusing and cumbersome. This text provides a consistent and coherent framework for uniting the field of public policy. Authors Kevin B. Smith and Christopher W. Larimer offer an organized and comprehensive overview of the core questions and concepts, major theoretical frameworks, primary methodological approaches, and key controversies and debates in each subfield of policy studies from the policy process and policy analysis to program evaluation and policy implementation. The third edition has been updated throughout to include the latest scholarship and approaches in the field, including new and expanded coverage of behavioral economics, the narrative policy framework, Fourth Generation implementation studies, the policy regime approach, field experiments, and the debate of program versus policy implementation studies. 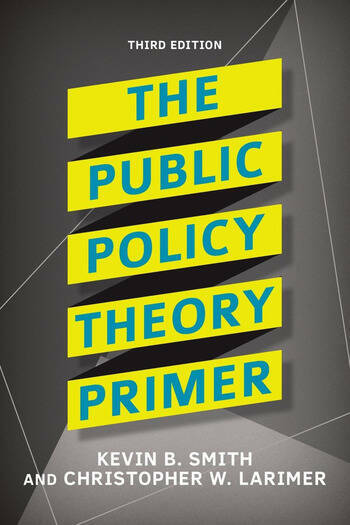 Now with an appendix of sample comprehensive exam questions, The Public Policy Theory Primer remains an indispensable text for the systematic study of public policy. 2. Does Politics Cause Policy? Does Policy Cause Politics? 10. Do the Policy Sciences Exist? Kevin B. Smith is Professor of Political Science at the University of Nebraska, Lincoln. Christopher W. Larimer is Associate Professor of Political Science at the University of Northern Iowa.